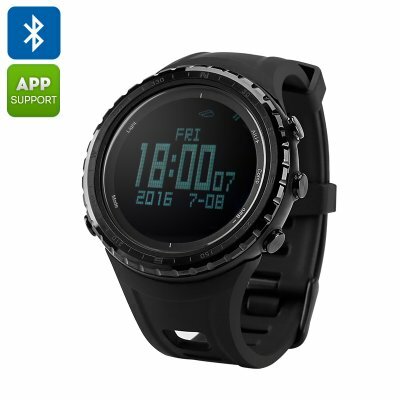 Successfully Added Sunroad FR803 Smart Watch - Bluetooth, 5 ATM Waterproof, Digital LED Backlight, Swiss Sensors, Altimeter, Barometer, Compass to your Shopping Cart. Get outdoors for some nature fun with the SunroadFR803 smart watch — the perfect outdoor companion, featuring smooth Bluetooth connectivity, precision sensors by Watchmakers Swiss and is 5 ATM waterproof. If you lead an active lifestyle, love the outdoors and often find yourself running, camping or trekking — it may be hard to find nice accessories to keep you company on your adventures. But while most gadgets are not built to withstand the harsh outdoor conditions, the Sunroad FR803 is a different story. The watch comes with a nice solid build and is made to be 5 ATM waterproof — meaning it can handle getting wet. So, if you love the outdoors then the Sunroad FR803 could well be the best choice. The sports watch comes with a convenient digital LED backlight, letting you see its small LCD display clearly even in the dark. It’s also loaded with features for hikers, campers and everyone who enjoys trekking the great outdoors. You will have a thermometer for real time weather reporting and a barometer to measure outside pressure that will let you make predictions about potential weather changes. The built-in compass can be a real life saver and will help you guide your way back to camp or help navigate to any other destination. If you love conquering heights, the watch is equipped with an altimeter that will keep you updated as to the altitude you are reaching and record your progress. With all its sporty functionality, the Sunroad FR803 is also an intelligent Bluetooth device. Simply pair with your smartphone and get timely notifications about incoming calls, messages, social media updates and more. The SunroadFR803 Smart Watch comes with a 12 months warranty, brought to you by the leader in electronic devices as well as wholesale Bluetooth smart watches..